Large display with blue illumination. Temperature adjustment: from 5 °C to 35 °C. 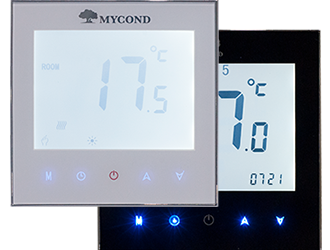 Temperature control of 2 parameters (air and floor temperature). Protection against frost and overheating. 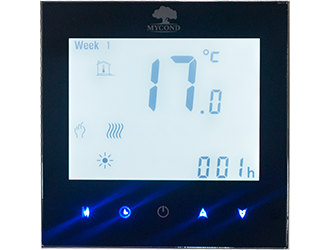 These remote controls are mainly used for boilers/water-heated floors/electric-heated floors/infrared panels/convector heating/radiators/other (within the limits being enlisted in the product certificate). Measurement accuracy: ± 0.5 °C. Range of reg. temp. : 5-35 °C. Power supply: AC95 ~ 240V 50 ~ 60Hz. Load: 3A (water), 16A (electric). Operating conditions: working temperature range - from 0 to 45 °C; relative humidity - from 5 to 90%.